James A. Doherty, Jr., is one of Pennsylvania’s most well-respected civil litigators. Born and raised in Scranton, Pennsylvania, Jim has spent his career advocating for his clients throughout the Commonwealth of Pennsylvania. He is the recipient of numerous professional awards from local and state associations for successfully representing and defending health care providers and institutions in an array of civil matters. Jim also chairs committees on medical and dental tort reform, and is a lecturer in the civil litigation areas of medical malpractice for physicians, hospitals, nursing homes, and mid-level health care providers. Jim has also served his community as an Ad Junct Professor in Business Law at the University of Scranton for over 10 years, chaired multiple committees and boards of local non-profit organizations, and has provided a portion of his practice to pro bono work. For over 34 years, he has concentrated his practice on civil litigation with a particular focus on medical malpractice defense and professional and personal liability litigation. Jim’s record in the courtroom evidences his success for his clients. 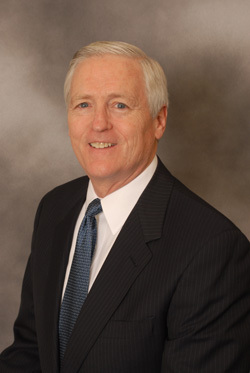 Jim presently serves as an independent arbitrator and mediator in all civil litigation matters. He is a member of the Pennsylvania Defense Institute and has served on the Lawyers Advisory Committee to the U.S. District Court for the Middle District of Pennsylvania. He has also been a Delegate to the Third Circuit Judicial Conference, and presently serves as the Administrator of the Court of Common Pleas of Lackawanna County for all District Justices. *Membership is by invitation only, designated only to 1% of lawyers in their respective states. These individuals have distinguished themselves in trial practice for at least 15 years, and are recognized leaders in their local communities. The College selects lawyers who are considered by other lawyers and judges to be the best in their states or provinces, lawyers whose ethical and moral standards are the highest, and lawyers who share the intangible quality of collegiality.